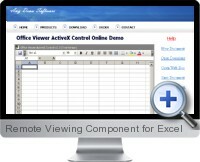 The easy-to-use Office Viewer ActiveX Control builds Excel applications rapidly. Easily create online Excel and Office viewer applications with the OCX. Support for Microsoft Office Word, Excel and PowerPoint. Offers some custom properties to set format and layout.